Hammad Azam, the 19-year-old Rawalpindi allrounder, struck a 54-ball 63 to guide Pakistan A to a narrow victory over Sri Lanka A with eight deliveries to spare at the Sinhalese Sports Club in Colombo. Pakistan looked set to lose their second match of the tri-series as well, after defeat in the opening game to South Africa A, when they sunk to 166 for 7 in the 43rd over, still needing 59 off 46 deliveries. Azam, though, with the help of highly rated fast bowler, Mohammad Talha, steered Pakistan to a win, blasting 14 off the first four deliveries of the penultimate over to confirm the victory. The pair's efforts came after the chase lost its way following a blistering start from captain Azeem Ghumman and Khurram Manzoor, who sped to 46 for 0 by the sixth over before three wickets fell for nine runs. 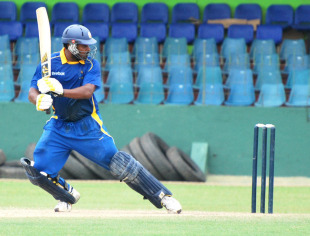 Thilina Kandamby, recently axed from the national side, took the next three wickets with his legspinners to put Pakistan in further trouble before Azam intervened. Kandamby had earlier top-scored for Sri Lanka with a 75-ball 63 that pushed the home side to a competitive score despite a lack of contribution from the other middle-order batsmen.